Traveling to Southeast Asia may make you feel that everything just looks like the same, such as white-sand beaches, old temples, tourist traps, etc. 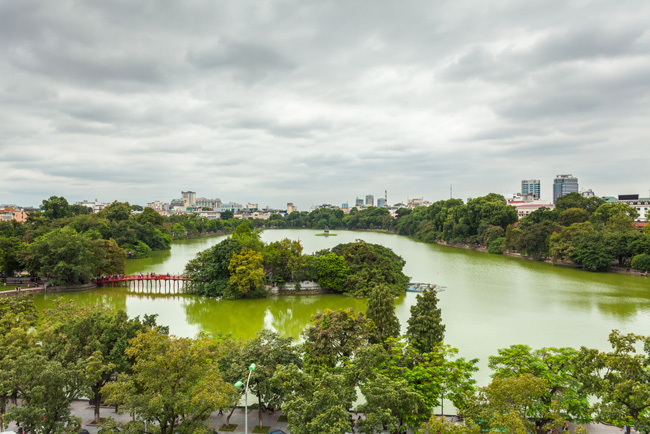 Your mind can be changed after you visit Hanoi – the capital of Vietnam. Landing on here is like a new breath of fresh air. While Ho Chi Minh City attracts tourists by its vigorous and lively vibe, Hanoi helps them feel peaceful in heart and mind. The city is an amazing combination of modern living and traditional culture, which is suited to both extroverts and introverts. If you are the first-time visitor who’s concerned about what to do, when to visit, etc., then this post of Hanoi travel guide can ease your worry for sure! By plane: Located about 45 kilometers North of Hanoi, Noi Bai International Airport serves as the main airport for domestic and international airlines. There are lots of regular flights which make it easy for tourists to choose from. Once you exit the airport, consider catching a metered taxi and mini-bus to reach any nearby hotel. But, if you’re still uncertain of using public conveyance, don’t mind requesting a hotel you’ve booked in advance to render airport service to you. 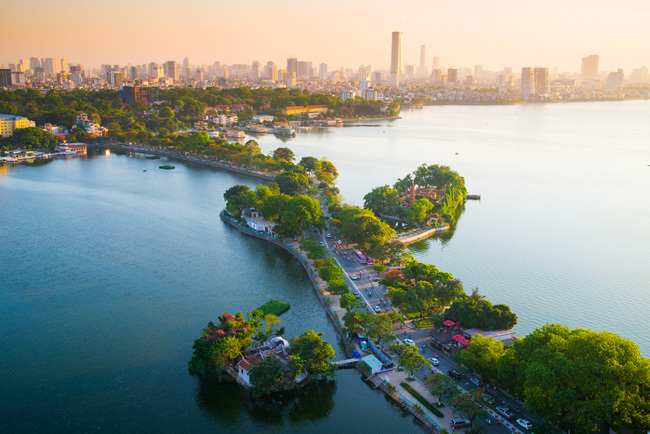 By train: Making a trip to Hanoi by train is also a nice idea because the city’s prime train station is not far from the centre of Hoan Kiem Lake. But, make sure that you check the cost’s ticket and route before departure. By bus: Hanoi is a large transportation hub. You can catch the first-class sleeper bus from Ho Chi Minh City to Hanoi with an affordable price. The city is endowed with 4 distinctive seasons. So, the time for departure partly depends on your travel purpose and your desirable activities once checking in here. In general, saying Hello to Hanoi in spring or autumn (from October to December) to enjoy cooler weather and avoid heat is a good choice. Or, you may stay away from the rainy season by making a travel plan between October and April. If watching many colorful parades and joining in temple celebrations are your main goals for this vacation, then make sure to arrive during Tet Holiday, which often takes place in late January or early February. Situated at Tong Dan Street, this museum will be worth an arrival, if you are particularly interested in how Hanoi was in the past and the country’s revolutionary history. Events from 1858 to 1945 are mainly highlighted here. Although many artifacts in the museum are fascinating enough to get high attention from viewers, these simply aim for a less emotional and shocking pitch than those artifacts in War Remnants Museum, Ho Chi Minh City. Thus, items and documents here don’t fully convey the raw zeal which historical events occurred. Also called Lake of the Restored Sword, this place gets its name famous for an interesting legend. It was about Le Loi King who used the sword – a gift from heaven – to fight against a neighboring country and won a noble victory. One day, when taking a boat trip around the Thuy Quan Lake, a giant tortoise rose above water and asked him to return the sword to the Dragon King. He then threw the sword to the lake without any hesitancy. And the name “Hoan Kiem” started from then on. In general, from dawn to dusk, the lake is full of exciting activities. If waking up early, you can see lots of the elder and young people taking exercise or practicing Tai-chi. The afternoon is an ideal time to rent a cyclo and go around the lake with a handy camera. Once the sun goes down, it is easy to watch couples sitting on long benches to have sweet conversations or going for a stroll hand in hand along the lake. 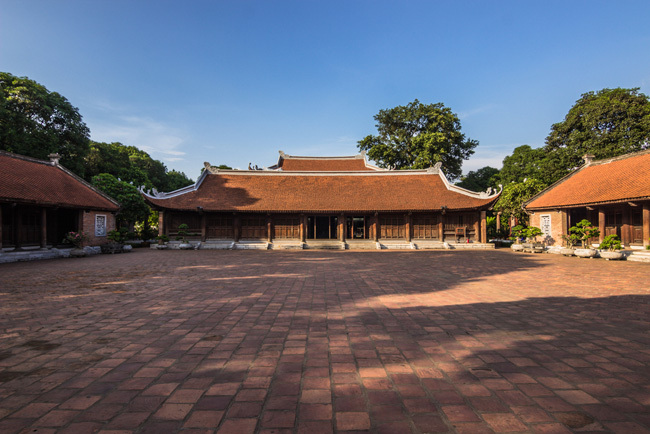 Just about a 10-minute walk away from Hoan Kiem Lake, Temple of Literature is another must-see destination you should not miss. 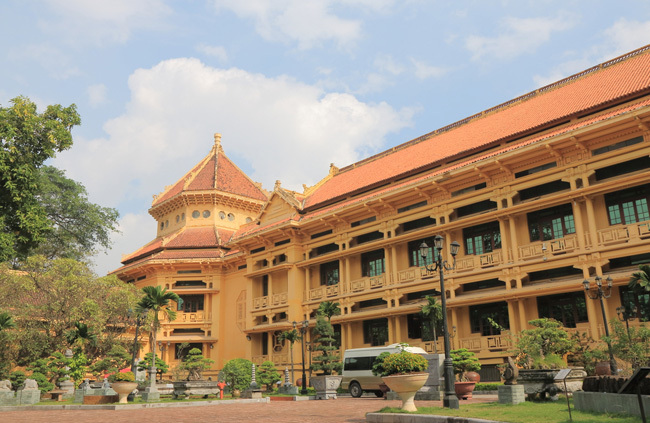 It is considered the first university in Vietnam, which also serves as a monument to dozens of high-rank scholars. Visiting this temple gives you a chance to not only admire its classic architecture, but also learn more about its cultural and historic values. The opening time ranges from 8.00 AM to 5 PM with admission fee about 20,000 VND for adults and 10,000 VND for kids. 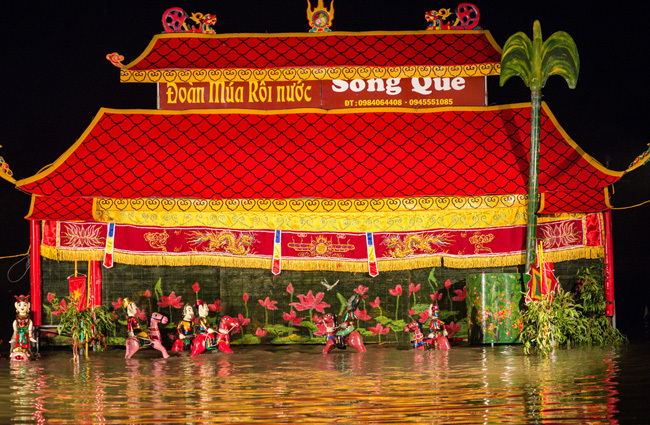 A trip to the Northern Vietnam will not be complete without watching a performance of water puppetry. It is actually a traditional Vietnamese art form, dating back many centuries. A show tends to be performed in a pool of water, where the wooden puppets are manually controlled by skillful and talented artists. It basically displays the daily life of farmers (cultivating, catching fishes, harvesting, etc. ), historical legends, or even communal festivals (dragon dancing, swimming contest, etc..). You are able to buy tickets and enjoy water puppet performances in 2 main theatres, including Thang Long Water Puppet Theatre and Vietnam Puppet Theatre. Going with children is also a good way to help them enhance their knowledge and bring them excitement. 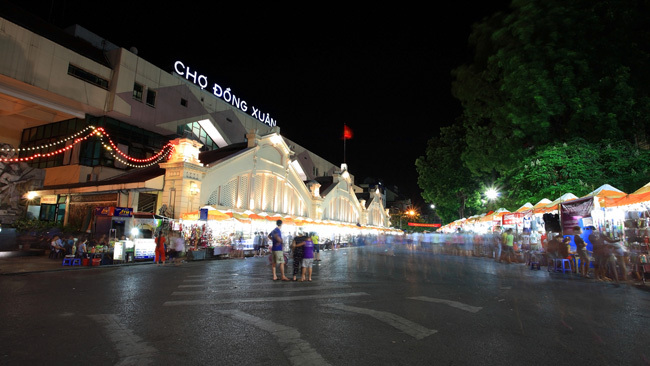 If your hotel or guest house is within the Old Quarter, and you would like to discover how nightlife in the city is, then head towards Dong Xuan night market now! You can find anything in this market, from sweets, salted dry fruit (ô mai), to clothes, stationeries, decorations, and toys. Even shopping is not your main purpose, roaming around to feel the atmosphere, savoring some snack, and chatting with other friends are highly recommended. 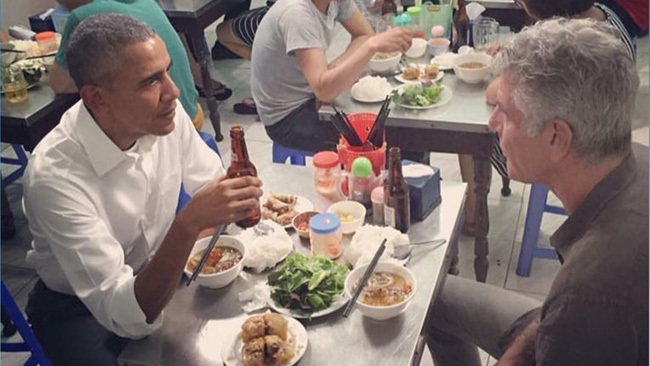 Hanoi is also reputable for inexpensive but delicious dishes, which may be found in narrow alleyways and busy street markets around Old Quarter. Perhaps, there is nowhere else in Vietnam, but Hanoi in which its food has become the popular topic for many reputable writers and journalists. Further, the city’s gastronomy is also considered an art from careful cooking to enjoying stages. Some ideas of dishes from Hanoi you should not miss include Xoi xeo (Xôi xéo), La Vong grilled fish pie (Chả cá Lã Vọng), green rice flakes in Vong village (Cốm Làng Vòng), hot crunchy fried shrimp cakes (Bánh Tôm), Pho (Noodle soup), Bun Thang (vermicelli with chicken soup), Thanh Tri steamed rolled rice pancake (Bánh Cuốn Thanh Trì), and so on! Such dishes are at their finest and most delicious when gourmets use all their 5 senses to feel their essence.